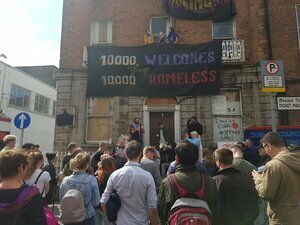 Protestors from Take Back the City, outside the offices of the Residential Tenancies Board at O’Connell Bridge House, which they occupied today while issuing demands for the housing crisis to be addressed. High Street, Christchurch, Dublin 8. 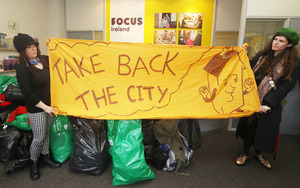 Take Back thew City protestors occupy the headquarters of homeless charity Focus Ireland. 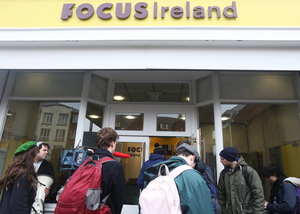 Taking It Back Taking Back Waterford ‘How Can You Justify These Actions?’ Second-Hand Import? Posted in Misc and tagged Take Back The City at 1:28 pm on November 21, 2018 by Bodger. Wonder how many people are aware that the cost of keeping the RTB in its luxurious office and paying the barristers solicitors and properly professionals who deal with its adjudication ultimately gets passed on to the tenants in rent? Is it worth it? Yes, it was for me when I got back my deposit plus damages when my landlord turfed me out because I wouldn’t shut up about the pervasive black mould in the house. and mate…if you had EVER been in the RTB offices you’d know they’re not luxurious. Yup, boyo above me with electric guitar and amp. + mates with likewise popping around most days. Landlord done nothing so claim to RTB forced return of deposit. 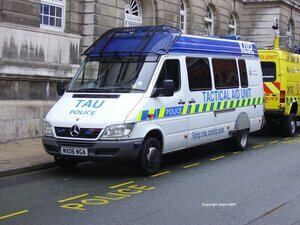 RTB may have its faults but I was dammed glad of their help. A little tip to anyone having rental issues, make all complaints by email and keep a copy as RTB will accept such. another tip: if you are a landlord renting out you can search (on the RTB website) through all historic adjudications and see if your potential tenants have been through them and have any dubious cases against them. Tip 3. If your landlord is a limited company, who also tenders for public services, they will be very cognisant of the fact that a judgement by RTB will disqualify them from potential business. @ Cian, problem is, a lot fold before it ever goes to adjudication of course. another tip: if you are a tenant renting you can search (on the RTB website) through all historic adjudications and see if your potential landlords have been through them and have any dubious cases against them. Housing is an inelastic supply. Additional costs (grants, benefits & allowances too) are ultimately passed on to the asset owner no matter who actually pays (or receives) the bill (grant). The price that renters are willing to meet (Demand) fluctuates far quicker than the supply does so any monetary interventions in to the market are ultimately felt (good and bad) by who holds the supply side. Cian , can you explain why this is terribly wrong? I’m not sure about ‘wrong’, but neither do I see how it is the RTB’s fault that rents are so high. 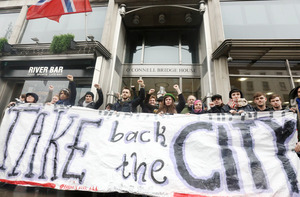 As Rob says – it’s not the RTB’s fault that rents are too high. It’s like a child kicking the cat because her sister was mean to her. RTB was set up to remove tenancy-related disputes from the courts. This was to free up court time for more ‘serious’ cases, and also cost reduction – you don’t need to hire solicitors to raise a dispute. There is a €15 fee and that’s it. As for Liza Lu’s “barristers solicitors and properly professionals ” – I’m sure that they are paid less than the judges that used to provide this service. Oh, and Local Authorities are responsible for enforcing minimum standards for rented housing – not RTB. Legitimacy of the gripe aside, what kind of straight gig allows these cats to enjoy the life of dilettante flaneurs* in comedy headgear**? Thanks, Neilo, I needed this comment to mark off the “get a job” square in my protest bingo sheet. They look like mostly students to me. @Starina: Cheers, kid! You’re very tolerant of human foibles. PS I seem to recall you’re a fan of the hard stuff. I sampled some of that Jameson Black Barrel at the weekend – very nice, indeed. haha wow that was ages ago. I love a good whiskey in the wintertime. cheers, pal! 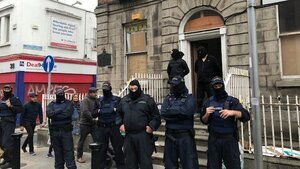 It’s nice to see the Trinity students union members are getting out and about, it’s also good to see that most of them are wearing appropriately warm outerwear and headgear so that they do not get cold for the couple of hours protesting before they go home to their comfortable accommodation. On the plus side they will have some great pictures to share to Facebook and virtue single with. Fair play also to the 2 ladies pictured who made the flag. They are wearing extra nice hats! I’m not too sure what the flag is meant to symbolise but then again I only work for a living and pay bills so what do I know. Could you repeat this comment in english please. 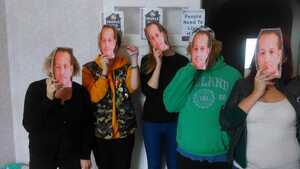 They occupied the HQ of a housing charity to make a point about homelessness. That’s remarkably daft. A day out virtue signalling for the lads. Oh wow. I didn’t know that. Defo checking out my current landlord! It’s a great resource actually, and seriously underused. Used it a few times myself. i’m so disappointed to hear that you work. i thought you were positively bourgeois but you’re just a plebian like the rest of us. I even saw her in Lidl doing her big shop. I would have put her down as an M&S shopper at the very least, if not a Donneybrook Fair regular. I’ll stay positive and go with the former.